Four years of hard work has paid off for a Bangor University student who returned to education after a period of working as a learning support assistant in a special needs school. Emma Andrews, 27, from Leigh-on-Sea in Essex graduated with an honours degree in French and Spanish and was also awarded the Dr Ben Fisher Prize of £100. The prize was established in 2009 by friends and colleagues of the late Dr Ben Fisher, a senior lecturer in the School of Modern Languages, following his death in July 2009. The prize is awarded for the most original dissertation or three language project in French. Extremely happy to be graduating, the former SEEVIC College student said: “I’ve thoroughly enjoyed my time in Bangor over the past four years and it feel brilliant to be graduating. Winning the Dr Ben Fisher prize was completely unexpected, and I’m thrilled to be honoured with this award. “After I had decided that I was going to return to education, I researched which university would be the best option for me. Bangor especially appealed to me due to its location and the excellent reputation of the School of Modern Languages. “Whilst studying, I worked part-time between semesters at my previous employment, which continued to give me valuable teaching experience. I was part of the Language Society and the Bangor University Dance Society. During my first year I was a member of the Bangor University Choir and became a Peer Guide in my second year. “As part of my degree course, I spent a year abroad, studying in Spain and Mons, Belgium. During that time, I took part in the European Centre for Training and Regional co-operation scheme and worked for three months in Barcelona as a waitress in a 4* hotel. In Vigo, Galicia, I volunteered teaching English to a child with hearing impairment through the ’Asociación de Padres de Sordos de Vigo’. 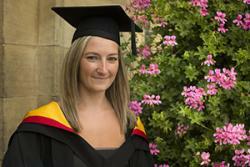 Emma plans to continue with her studies and return to Bangor to complete and MA in Translation Studies.